We are only six weeks away from the expiration date of the Early Bird discount period, during which you can get the best deal on tickets for February’s Oregon Wine Symposium. If you renew your membership in or join the Oregon Winegrowers Association, you are immediately eligible for an even sharper price using OWA’s membership discount. Don’t forget those on your holiday shopping list who are hoping you’ll treat them to another sensational Symposium, Feb. 12-13. The year-end issue of Wine Spectator includes a two-page spread featuring Oregon wineries that jumped on the chance to reach the magazine’s 300,000 fine wine consumers and trade members. These opportunities have been announced to all industry members in this newsletter during the year and provide broad national exposure to brands that in many cases could not afford a fractional page in the Spectator on their own, even if the publication were to offer them. The OWB’s investment results in deep discounts for participating wineries but the spots have to be allocated on a first-come-first-served basis. We will continue to work with Wine Spectator to make these available in 2019. 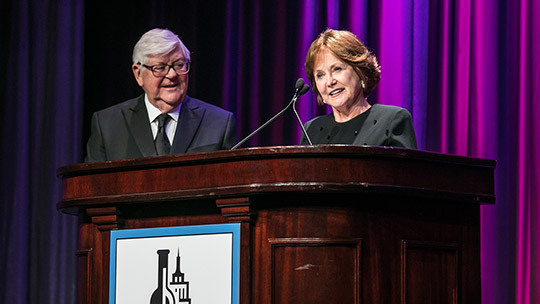 Grace and Ken are the first business leaders from the Pacific Northwest ever chosen for this coveted recognition, and they join a remarkable roster of previous honorees including Robert Mondavi, Julia Child, Robert Drouhin, Piero Antinori and Barbara Banke. Congratulations Grace and Ken! Widespread media coverage, both locally and nationally, has focused lately on federal regulations and state rules governing wine labeling and production. It’s somewhat unusual that a technical topic like that would attract such attention. However, marketplace developments involving an out-of-state winery purchasing Oregon grapes and crushing them in California demanded a response that has captured the attention of customers and consumers as well as wine business owners, regulators and lawmakers. Since August the OWA has worked in concert with member wineries, Oregon’s regional industry associations, Wine America and state lawmakers, including Rep. David Gomberg, to urge fact-finding and the appropriate enforcement of regulations and rules dictating how a winery presents what is made from Oregon’s treasured, and future, AVAs. OWA’s actions so far have been focused on ensuring compliance with current rules and regulations. OWA’s objectives are distinct and separate from those of other regional interests seeking expanded varietal content and fruit sourcing requirements. The OWA Board is taking these steps on behalf of every Oregon winemaker and grape grower to protect our shared geographic equities and winemaking standards. The benefits of this campaign for compliance will extend beyond the fractional subset of Oregon’s wine businesses that count themselves as OWA members. Working cooperatively, this alliance has seen the TTB take a first step by ordering that label corrections be made by a winery found to be misleading consumers. And for the first time ever, the Oregon Liquor Control Commission is now in the process of enforcing Oregon’s 41-year-old labeling rules in action related to that same winery. We will keep you informed as this continues to play out. Oregon wine is synonymous with quality. The Enology track at the 2019 Symposium will focus on tools for new and experienced winemakers alike to support our collective high quality standards, even under tricky conditions. With the majority of Oregon wineries producing fewer than 5,000 cases, the DTC channel plays a critical role in the success of many in our industry. The 2019 Symposium features a track dedicated to DTC practices to help small wineries up their game in this space. Order a box or two of the 2018 Oregon Wine Touring Guide now to ensure you’re well stocked for the holiday season. The guide is available for complimentary order and delivery and makes a great value add in club shipments and holiday orders. Oregon Wine Trail is going to Toronto. Register to join the OWB as we return to Toronto in April, where we will host an Oregon Wine Trail trade and consumer tasting as well as multiple master classes for the trade. Last week, we conducted four webinars to demonstrate use of the Oregon Wine Profit Planner Workbooks. The recordings can be accessed through the Oregon Wine Profit Planner page on the industry website. OWB has prepared a package for wineries to use in presenting Oregon Wine Month 2019 to distributors in state and around the country. Watch the webinar recording to learn how to equip your distributors to make the most of Oregon Wine Month. The deadline to enroll distributors to participate in Oregon Wine Month 2019 is Feb. 1. OWB is sponsoring two WISE Academy workshops during Symposium week, offering them at $55 (normally $700). Tasting Room Management Training will take place Feb. 11, with DTC Metrics Intensive happening Feb. 14. This fall, more than 1,500 tourism partners – including those from the wine industry – participated in Travel Oregon’s tourism engagement survey. The analysis of results, statewide and by region, is now available. On Nov. 6, Dr. Greg Jones of Linfield College published an updated weather and climate summary and forecast. This report looks back at October conditions, provides an updated drought watch, and forecasts conditions for November, December and January. Jeff Kralik at The Drunken Cyclist is seeking Oregon Brut and Brut rosé to review. He plans to publish his results before Christmas. Beverage and lifestyle writer Jeff Gordinier is seeking samples of Oregon Pinot noir for a spring story on entertaining in Esquire Magazine. OWB is partnering with FedEx to provide free FedEx Ground shipping on Oregon entries to the TEXSOM International Wine Awards. This program is running through Dec. 31. The ODA is accepting proposals for the 2019 Specialty Crop Block Grant program, with applications due at noon on Jan. 31. Requests for letters of support to accompany applications are due to the OWB by Jan. 15. Grand Prix racing will be coming to Portland over Labor Day weekend 2019. Sponsorship opportunities for wineries include local retail activations, online advertising and more. Contact Chris O’Brien to learn more. The Culinary Institute of America is seeking wine sponsors for a slate of 2019 events. The Wine Advocate and James Suckling recently published their reviews of Oregon’s 2016 vintage. We have written a synopsis of their reports, and subscribers to each publication can access the full tasting notes and reports through their respective sites. If you are looking for a buyer for your grapes, or are interested in buying grapes, don’t forget to check out the Marketplace on the OWB’s industry website. The Marketplace also includes listings for bulk wine, equipment and job opportunities.